My blog posting might be erratic lately but I’m enjoying sharing all my backlog of makes. Feels like I’m airing them out on the washing line. So today I’ve got proof that I jumped on the scuba-wagon. I have no idea what a scuba-wagon might look like but now I’m thinking of scuba dragons so that’s fun. 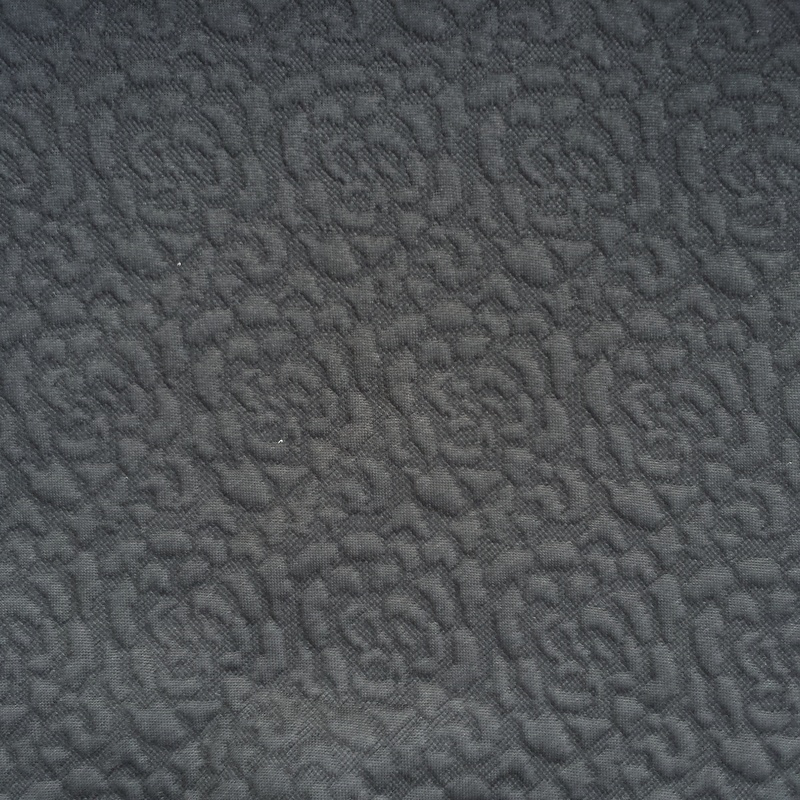 I picked up this gorgeous rose embossed scuba on a Walthamstow trip with Katie. (She bought this lush marbled print scuba). It was £6 a metre which I thought was reasonable given its prettiness and weight. Plus it was nice and wide so I got 1.5 metres. 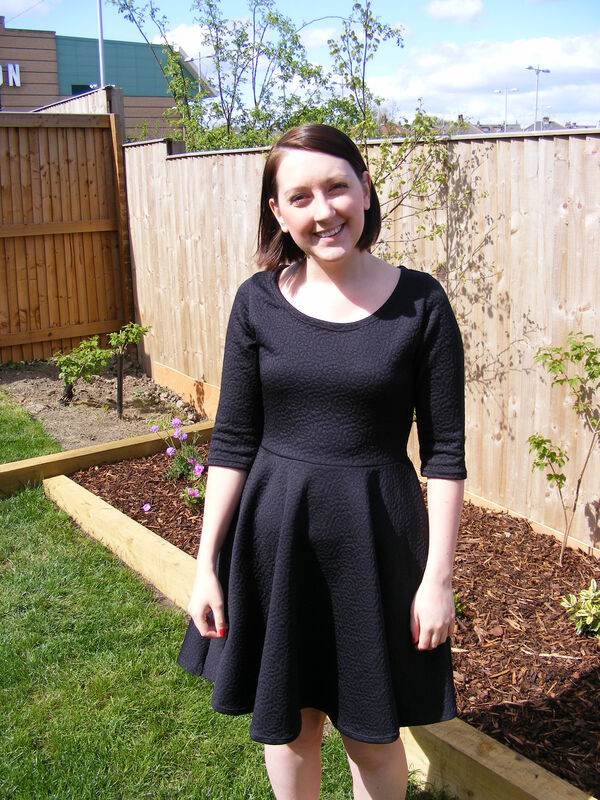 So in classic form this is the dixie diy dress bodice. I opted for long sleeves like my horse dress and a circle skirt like my Jungle January dress. Here’s a pro tip… If you want to topstitch embossed scuba with a twin need;e you’re probably going to have to leave perfectionism at the door. No matter how slowly you go, both needles wants to bobble off course into one of the grooves of the pattern. The scary bit is if the two needles want to go separate directions! I think it looks okay though so I’m not worrying about it. The rose design makes me swoon and the scuba gives the dress a more formal structure which I really like. Maybe it’s time for some science? Are you sitting at home thinking what the flip is the difference between scuba and neoprene? Scuba is a type of double knit made from polyester and spandex, with a very fine gauge thread, and smooth texture. It’s what you’ll have seen clothes in magazines and the high street made of, and it’s extremely likely that if you’ve bought “neoprene” from the fabric shop you’ve actually bought scuba. Neoprene is a synthetic rubber and fabric hybrid which is more durable, more flexible and a better insulator, hence being primarily used for wetsuits. Essentially it’s a thin knit fabric sealed onto spongy foamed neoprene. I feel happy to say this confidently because I have friends in the adventure sports industry who have discussed this with me as we’ve talked about their kits and the variations of “quality” neoprene. But if you have heard differently please let us know. So there you have it! Scuba-licious. ballet dressdixie diyneoprenerose printscubascuba vs neopreneWhat's the difference between scuba and neoprene? Love the dress! It looks so elegant in the rose fabric. And thanks for the fabric distinction, and now I know I’ve had the two mixed up all this time! Thanks! The roses are too cute, I’m so glad I found this fabric. Happy to share the info around so it’s out there with everyone. 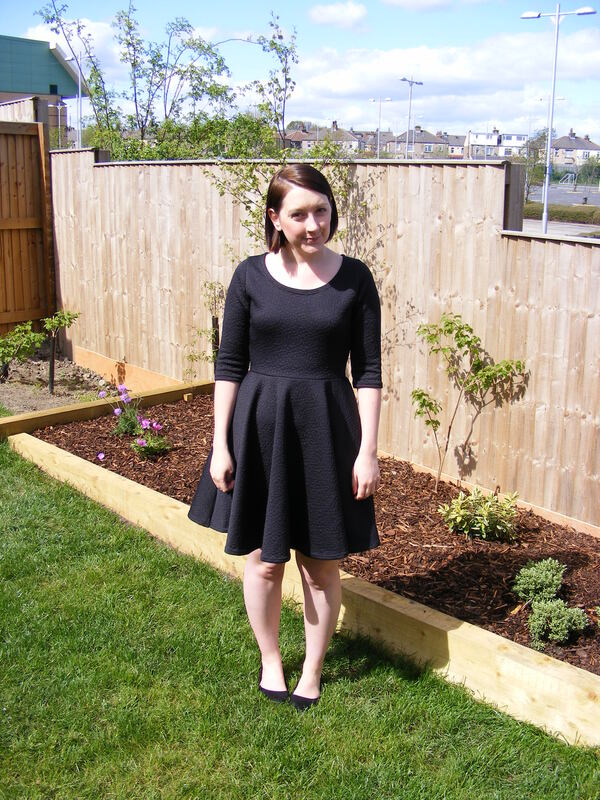 Good to get the old neoprene vs scuba debate cleared up so we can concentrate on your pretty dress. Love it! The fabric gives the skirt such a great shape! Thank you! It’s such a great swoosher and was really stable for sewing. I think it was you I discussed neoprene/scuba with on Twitter, so thanks for the clarification. Fun fact, my fabric store has “neoprene” in the catalogue and “scuba” in the store for the same fabric, so now I can use your definitions to clear it up. Also, your dress looks lovely, love the roses on the fabric. The dress looks so easy to wear. I love the more structured look. The roses are great too. Thank you! I really love the structure, it takes the whole thing up a notch. Pretty. I like embossed fabric its so tactile. Thank you! Me too. It’s almost too tactile! I play with the skirt on the train. Lady, this is freaking awesome! Such simple lines lets the fabric shine 😀 You’re kicking all the goals! I always wondered, about the scuba neoprene dilemma, and the warmth of the fabric! its lovely on you and you could probably wear it in the Autumn too? Hi! I’m looking for patterns I can try a fun scuba fabric (I got from the markets here in Shanghai) with… It’s way to hot now to wear it… but thinking now after seeing yours I could try the Moneta (as have the pattern in mind for something else) from Colette Patterns perhaps? The bodice is similar… ish. I LOVE the shape it gives your skirt here! This is a bit of a late comment, but twin needles are not all the same — just like regular needles, they come with different tips: Universal, Ballpoint, and Stretch. If you used twin needles with a universal tip but the fabric needs a stretch tip, you’ll get wonky stitching, especially really bad skips, etc. This is so pretty! 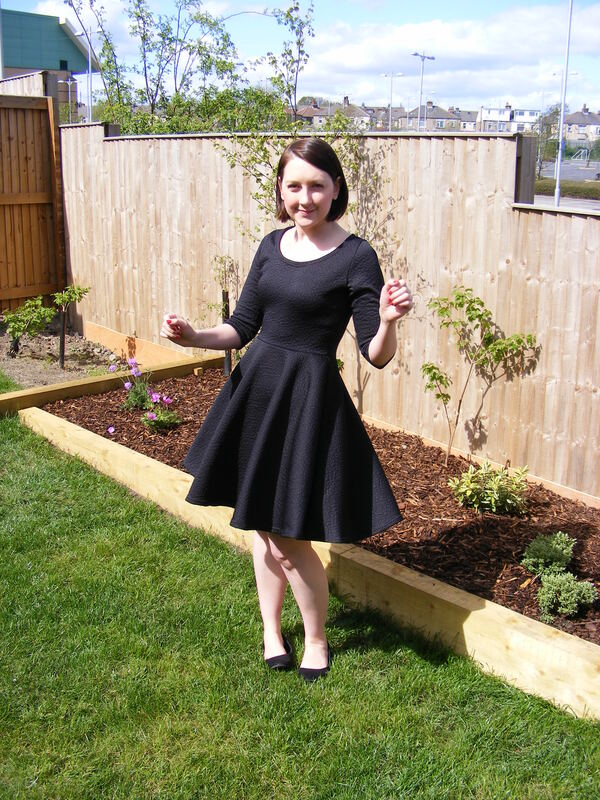 The skirt looks so lush in this fabric!